Digital analytics has changed. Drastically. No longer are we limited to measuring a website or mobile app – we can truly measure just about anything. To prove that point, today we are measuring the great game of Bocce Ball. That’s right, gleeful Opticon attendees will enjoy the favorite pastime of elderly Italian gentleman on a beautiful terrace overlooking San Francisco – and we will capture it all using Google Analytics. What’s even better is that you can follow along at bocce.analyticspros.com where we have prepared a live gamecast and leaderboard for the sporting pleasure of both attendees and home viewers. As long-time fans and users of Optimizely, we were excited to hear about their first user conference and even more excited when we learned that there was going to be a bocce ball court. We, of course, jumped on that opportunity and began to joke around about measuring it all. Those jokes turned into a few impromptu whiteboarding sessions and then a round of beers and bocce at Seattle’s one-and-only bocce bar, Von Trapps. That was all of the inspiration we needed and a plan began to take shape. We turned Brandon “The Dude” Nutter and Luka “The Slovenian Sensation” Cempre loose on the project and had a working prototype relatively quickly. 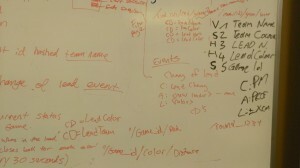 They then continued to refine both the tracking and leaderboard over the course of a few weeks. 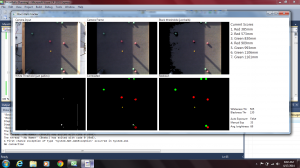 In short, we are using a Microsoft Kinect to track the position of the bocce balls in relationship to the pallino (the white or yellow ball). 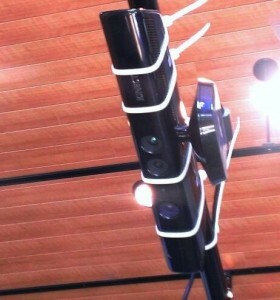 The Kinect acts as the main sensor and, with a bunch of software magic, creates a digital representation of the Bocce court in real-time. We then process the measurement and distance data, along with details about the teams playing and beam it up to Google Analytics via the Measurement Protocol. Our team built a web app on Google AppEngine to then ingest this data and display it, along with a live feed of the Bocce Court, at The Eye of Bocce (our fond name for this whole contraption, and yes, LOTR may have influenced this name). We tested it in many scenarios, like a backyard, with chickens running interference and the sidewalk in front of our office. In addition to measuring the court, we are also measuring the Bocce web app and, using Universal Analytics, are able to tie together the data about the Bocce Ball match with the web behaviors of the team members that signed up. Can you really do cross-device tracking? Apparently, yes, even non-digital devices like Bocce Balls! While measuring Bocce Ball is fun, it proves the point that Google’s new Universal Analytics and Measurement Protocol really can enable organizations to measure their entire digital ecosystem as well as the non-digital parts that interface with it. To learn more about how we made all this work, join us for a webinar on Thursday, April 24th at 10am Pacific. Brandon and Luka will discuss the tracking that they put in place and how it can translate into other forms of measurement in a more practical, real-world scenario. Register here. The concept of “the measurement of things” has been around for a while, but is finally becoming possible. 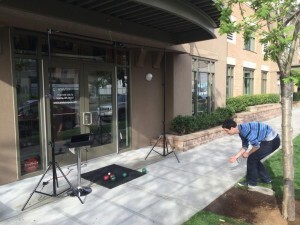 Measuring bocce is fun, but what really has us excited is the opportunity that it represents. Connecting with your customers is harder than ever as they interact on various devices and platforms. Universal Analytics is making it possible to tie that whole picture together. We will continue to unpack what all of this means over the next few weeks, but essentially we can now tie together physical interactions with digital interactions in a way that helps you better serve your customers. However, for today, we will sit back, enjoy the game and revel in the data that is pouring in. You can follow live games at bocce.analyticspros.com and gameplay action on Twitter under #boccepros and #opticon2014. Be sure to check out the live gamecast on our Eye of Bocce site and just track via the tagboard below.